Designed, engineered and constructed to be a ship of handsome modern appearance, GYPSY LADY features uncompromised seaworthiness and luxurious features. A combination of Dutch craftsmanship and US machinery, equipment, appliances and voltages, this yacht is a strong and flexible boat, both self-sufficient and elegant. Thanks to regular extensive upgrades and improvements, all mechanical and electrical systems up to date, including new satellite systems. The powerful bow-thruster provide excellent manoeuvrability, and on arrival at your chosen destination, the wave runner, jet ski and new Avon 320 jet-drive tender provide an exciting way to explore your surroundings. 2 x 200 lb. galvanized Pool anchors in hawse pipes, each with 325’ of 18mm galvanized and calibrated short link chain. Main electrical control panels, refrigeration, isolation transformers, stabilizers, etc. Fixed 3’ slow speed fine mounted aft stabilizers, plus bilge keels. Marine Air reverse cycle air conditioning / heating throughout the yacht. 240v ac 60 cycle Stork pump (1) for fuel from six bunkers to day tank controlled by automatic high/low tank sensors. Details are thought to be reliable but are not guaranteed. Offer subject to change, prior sale, and tax when applicable. Measurements are in U.S. units. The interior on the main deck offers two important living areas: the salon with comfortable settees and couches in soft tones and fabrics, and the spacious wheelhouse which often doubles as dining area. There is a dayhead on the maindeck. On the lower deck, the owner’s quarters are aft while the guest cabins are all located in the front. The galley with a second dining area is full beam and is situated in the middle. The interior is beautifully finished in teak. An excellent open galley means amateur cooks and professional chefs alike love to prepare dinner, served either al fresco or in the dining areas. The galley is fully equipped and provides ample fridge-,freezer-, and storage capacity. A thoroughly complete package is available including Robertson Gyro compass, Furuno depthsounder, Skanti VHF, Kelvin Hughes searadar and riverradar, Robertson autopilot, Simrad chartdisplay and information system, Inmarsat Satcom-M, Furuno Navtex. Shorepower and battery chargers, service batteries, separate batteries for engines and generators. Two Northern Lights 33kW generators (4300 hours), soundproofed. All decks are teak-covered, lazy stairways to all deck levels. Large swimming platform with (second) access to engine room. Aft deck with large settee and chairs. 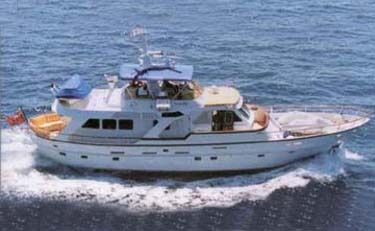 Wide side decks lead to to a very large foredeck which offers ample seating and sunbathing space. Fly bridge incorporates fixed seating and table for lunch, cocktails or dinner. Well protected by bimini. Second steering position on fly bridge.